Just after publishing my last post, I found this. It has a depth and sadness that my quickly grabbed photographs do not emulate. 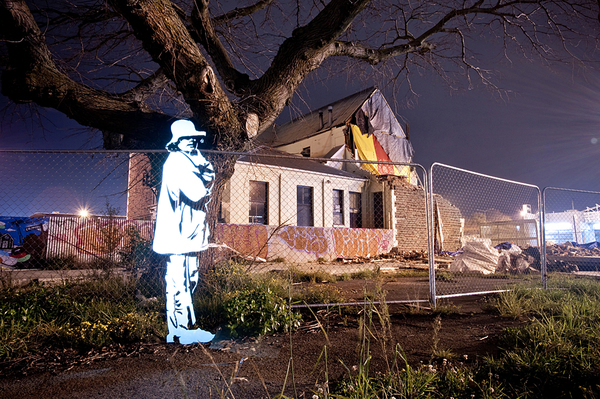 “Enlighted Souls is a light painting project I started in May 2011 in Christchurch, New Zealand. I first thought of it as an artistic and moral contribution to the 6.3 quake’s aftermath. I used stencils to paint enlightened characters to remember human losses and to show the spirit of a wounded city. It turned out to be an interesting way to share ideas and feelings about society and life. After all, this is what street art is made for. Posted in New Zealand, Photography, Travel Photography. Bookmark the permalink.